← Trying to Sell Surplus Test Equipment? 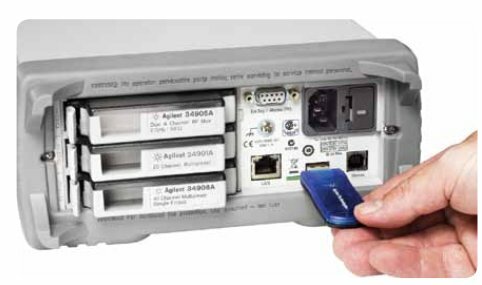 The Agilent 34972A is a Data Logger Switch/Data Acquisition unit that comprises a 3-slot mainframe and modules. It features a convenient, built-in DMM along with eight separate control and switch modules. The built-in USB and LAN interface make it a simple task for technicians to connect it to either a laptop or PC, all without requiring converter interfaces or additional IO cards. The 34972A allows operators to carry out field applications without requiring a computer. Data logging configurations are easily uploaded into this instrument from the BenchLink Data Logger using a USB flash drive. Users can easily connect the USB flash drive to the PC and import test results into a spreadsheet for data analysis. In addition, a user can also import the data into other applications that are suitable for easy analysis. Its graphical web interface enhances remote control, which really enhances data monitoring, data logging, and channel measurement configuration. The Agilent 34972A is designed to support a variety of 34970A plug-in modules. Users can easily and quickly integrate the instrument into a test using simple address change. Integration of the 34972A into existing tests using this approach requires no hardware changes or wiring. The plug-in modules contain relay closure count and on-board screw terminals, which allow operators to create compact data logger with ease. By using this technique, a user obtains a low-cost switching unit or full-featured data acquisition unit that can be easily configured, connected, and used either on the bench, in field applications, or on a network. The 34972A comes with the powerful BenchLink Data-Logger software included. This software provides an intuitive Microsoft Windows interface that is suitable for real-time data display, test configuration, and data analysis. Technicians can easily set up and carry out measurements quickly, and use the built-in graphs and export data to help expedite tests Technicians can use the free software or employ 34830A BenchLink Data-Logger Pro. The latter offers advanced decision making and data logging features for the more complex data acquisition applications. Users are able to measure up to 11 separate input signals with the 34972A unit. It excels in test situations that require measurements of temperature using thermocouples, thermistors and RTDs. In addition, it allows for measuring current and DC/AC volt, frequency and period, and 2/4-wire resistance. 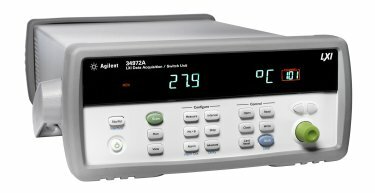 The Agilent 34972A Data unit is also compatible with the SCPI command set of the 34970A. Furthermore, it accepts virtually all 34970A control and switch plug-in modules. Its USB 2.0 interface and 1Gbit LAN enables operators to connect it to the PC when required. Data storage or transfer is accomplished by the USB memory port feature. The powerful offerings of this Data Logger Switch/Data Acquisition unit make a popular choice if needing a data acquisition and switching solution. This entry was posted in Site News and tagged Agilent 34972A. Bookmark the permalink.